Field hockey is a thrilling sport that people have played since the Middle Ages. It’s also intense. Players race back and forth across a field (aka “pitch”), striking a ball with sticks and trying to score against the other team. All this can do a lot of damage to a grass field. This makes it hard for more schools and towns to offer field hockey programs. The upkeep costs are simply too high. Luckily, many have found that artificial field turf fixes that problem. It holds up to the gameplay and stays in great shape even after poor weather strikes. In fact, pros have been using this type of surface since the 1970s, having realized how useful it is. With artificial field turf, leagues can play their sport without spending money on lawn care. Because of this, artificial field turf has opened the door for others to play this game. For those interested in starting a team or league in the San Francisco Bay Area, Watersavers Turf offers the perfect surface for their needs. As with any sport, this game carries some risk of injury. Much of this is due to the fact that sprinting along a grass field is not always safe. The ground may be uneven. This can lead to twisted ankles, trips, and other such harm. If it has rained recently, the grass could still be slippery. With an artificial hockey turf surface, though, this isn’t an issue. It always remains even, making falls less likely. Artificial hockey turf also stands up better to rain. On top of that, real grass could hide rocks or large stones beneath the soil. Falling on it could be painful. Falling on artificial hockey turf, on the other hand, is unlikely to cause harm. This is because it can be installed with shock padding underneath. This padding absorbs the impact, much like a mattress. As such, for parents concerned about letting their children play this sport, it goes a long way towards easing their worries. Field hockey is a unique sport. It can always be a challenge to know exactly where a game came from, but most can be traced back to a certain place or time. This one is different. There are images which seem to depict people playing it from many different cultures and time periods. Some think it may have started long ago in Ancient Greece. Others point to evidence that it began in Ancient Egypt. Still, others claim that it started somewhere in Europe during the Middle Ages. So, in other words, we don’t have a clue how this all really started. But we do know that as it is played today, the sport has its roots in a game played in early 19th-century English public schools. It first came to the Olympics in 1908 but was dropped in 1924. This upset many, and it was brought back for good in the 1928 Olympics. It wouldn’t be until the 1970s, though, that major changes would renew interest in the sport. That’s when teams started using faux grass as a playing surface. Unlike real grass, this caused the ball to bounce higher and more quickly. This change led to new ways of playing the game. For example, players began coming up with tricks like the “Indian dribble.” This move happens when a player quickly pushes the ball from right to left, then left to right, turning their hockey stick to do so. It’s a very tough move to defend against, one that wasn’t possible before faux grass. In fact, some of the sport’s rules had to be changed as a result of this new way of playing! 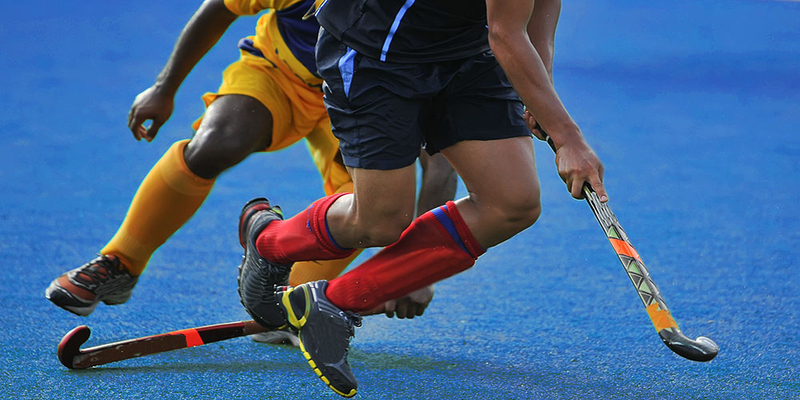 Today, field hockey is still played on artificial surfaces at the pro level. While schools and local teams sometimes rely on real grass, they’ve found that faux grass works much better for the sport. Fans who tuned into the 2016 Rio Olympics may have been surprised to see the look of the field hockey pitch. It was made out of a synthetic turf surface, which isn’t a surprise. Pro teams already know the value of that type of pitch. What was shocking was the color. It was bright blue, with lime green edges. Not only did this show off the colors of Brazil’s flag – it also made playing the sport easier. Players found that it wasn’t as hard to find the ball on the pitch. In the past, the color of the ball could blend in with the color of the pitch. Here, it stood out clearly. Without synthetic turf, they wouldn’t be able to play this game on a blue pitch. But then again, maybe they wouldn’t be able to play it at all. Synthetic turf added safety and energy to field hockey back in the 1970s. It’s the reason the game is what it is today. It’s also the reason it will keep growing in popularity. And Watersavers Turf has just the line of products to make that happen. To see what it would cost to build a pitch, get in touch with us for a free estimate. You can also stop by one of our SF Bay Area locations. We’re more than happy to offer free 1’ x 1’ samples. Give us a call at 844-974-8873 to learn more.